If you’ve never heard of Melba Toast before, prepare to meet your new favorite snack. These thin, buttery, crisp slices of bread are impossible to resist! Growing up, I looked forward to the day my mom made Melba Toast like I looked forward to a holiday. She only made it a few times a year, and for the week that followed, neither of us could keep ourselves from opening up the Tupperware container and sneaking a crunchy bite…or two…or nine. 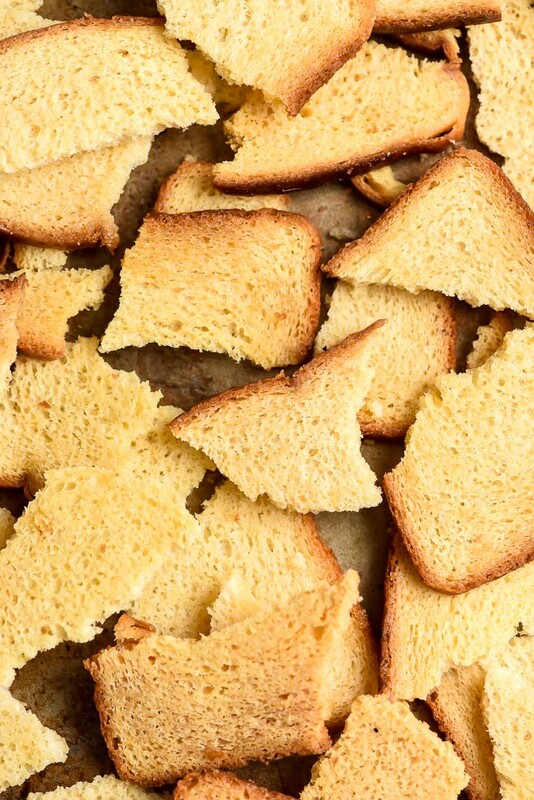 This Melba Toast recipe only has two ingredients, but don’t let the simplicity fool you. This is one of the best and most versatile snacks you can make. Traditional Melba Toast is simply very thin slices of bread toasted in the oven until dry and crisp. It’s often served alongside soups or salads or as a base for spreads, cheeses, or sandwich fixings. 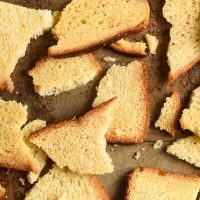 You can find it in the grocery store in the snack aisle, but the store bought version doesn’t even come CLOSE to this homemade Melba Toast. The main thing that sets my mom’s Melba Toast recipe apart is butter. That one additional ingredient makes all the difference. To make the toast, start with a very thin sliced bread, or slice your own. 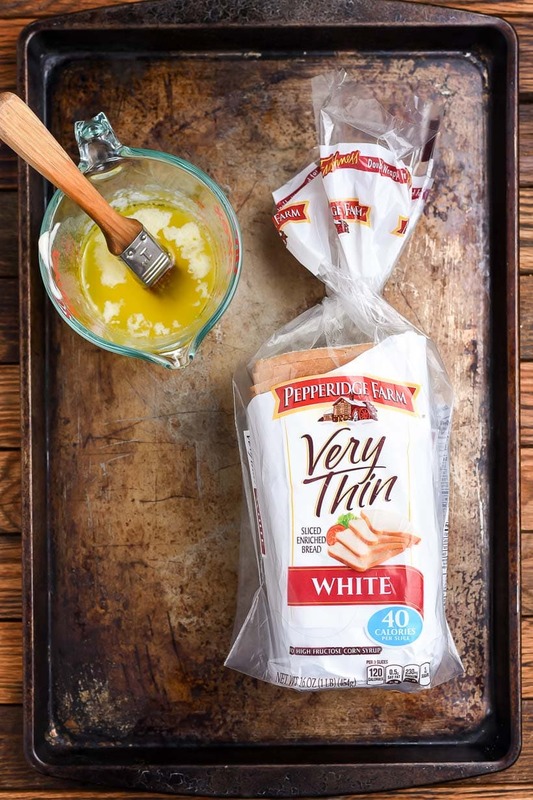 You can use any kind of bread for the recipe, but we usually use Pepperidge Farm’s very thin slice white bread. This bread is just the right thickness for the toast and saves the hassle of trying to slice uniformly thin slices yourself. Grab a stack of bread and some good quality softened butter. Don’t skimp on the butter here–it’s the main flavor agent, so the quality makes a difference. We really love Challenge and Plugra butter for this. 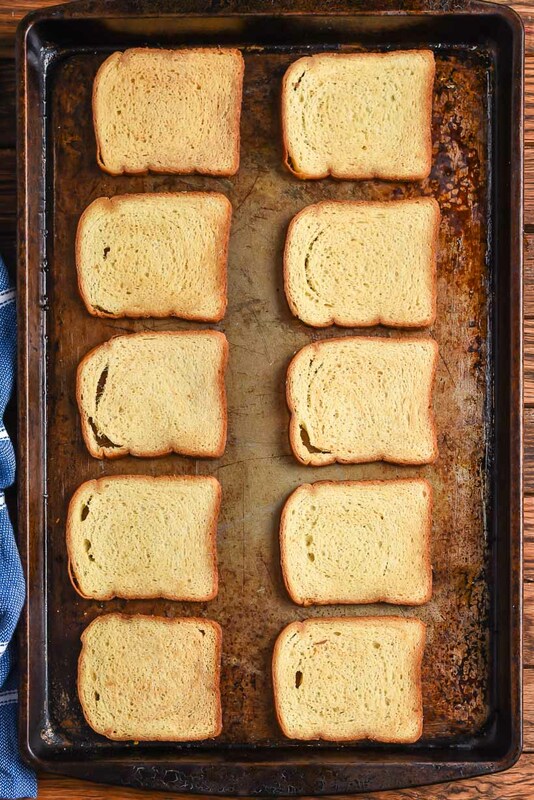 Spread both sides of the bread slices with the butter, then line them up on a baking tray. Set them in a low 250 degree oven to bake. I like to flip them halfway through to make sure they get nice and golden on both sides. That’s it! 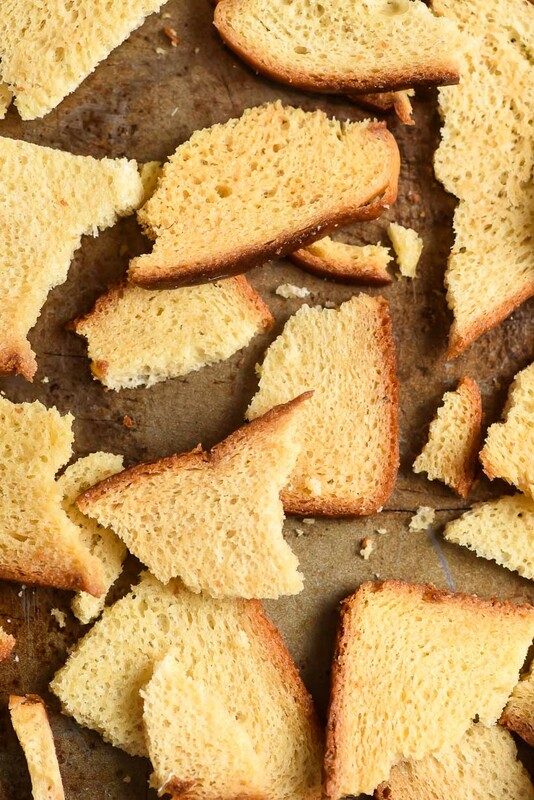 In about 40 minutes you’ll have magical, melt-in-your-mouth Melba Toast. If you have the will power to resist eating the toast pieces all by themselves (props to you! ), there are so many fun and delicious ways to use Melba Toast. If you leave the toast slices whole, you can use them in the same way you would crostini. It’s the perfect base for meats and cheeses, spreads, or salads. It’s excellent with Smoked Salmon Egg Salad (rye bread would be especially delicious here) or Cranberry Pistachio Chicken Salad. It also makes the most divine crunchy Avocado Toast. You can also break the toast into pieces and use them as a side for dips like Hot Crab Dip, Cheesy Bean Dip, or Hot Jalapeno Corn Dip. Crumbled, Melba Toast stands in for croutons on salad (try it on That Good Salad), or as a nice crispy finish to a bowl of Garden Fresh Tomato Basil Soup. You can even use the crumbs in place of Panko on this Creamy Baked Macaroni Cheese or add it to casseroles like this Cheesy Vegetarian Spaghetti Squash Casserole for a crunchy, buttery topping. This simple recipe is begging for you to take it and make it your own. 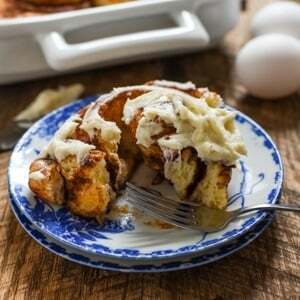 Feel free to experiment with different kinds of bread or seasonings. Rye, wheat, or honey oat are all great bread options. For seasonings, try mixing garlic powder into the butter, or take things in an entirely different direction with a sprinkling of cayenne pepper, homemade ranch seasoning, or curry powder. I hope you find this snack just as delightful as we do! Melba Toast is made by oven toasting thin slices of bread until they're crisp, buttery, and irresistibly delicious. Use Melba Toast with your favorite dip or crumble it on top of soups and salads for a delightful crunch! Spread a thin layer of butter on both sides of each slice of bread. If you'd like the toasts to be in smaller, uniform pieces, cut it into squares or triangles at this point. Otherwise, leave it whole. Line the slices up on a few baking sheets, and place in the oven. Bake for about 20 minutes then flip the slices the over. Continue to bake for another 15-25 minutes, or until the bread is golden brown and very crisp. Allow the toast to cool, then either leave it whole and use for dips, avocado toast, or crostini OR crumble the bread to use as a topping for soups and salads. Any flavor of bread can be used for this recipe, but I am partial to Pepperidge Farm's Very Thin Sliced White Bread. 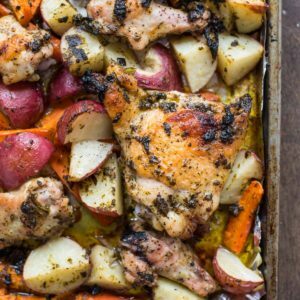 Feel free to experiment with other seasonings, like garlic powder, ranch, or cayenne.